Ungeachtet dessen, ob Sie den puren Look moderner Gartenmöbel oder die Wärme von klassischem Holz bevorzugen, werden Sie bei Royal Botania ein luxuriöses Sortiment finden, das Ihrem individuellen Geschmack entspricht. Unsere Kollektionen nutzen eine breite Vielfalt an qualitativ hochwertigen Materialien, die individuell gestaltet werden und nicht nur gut aussehen, sondern auch langlebig sind. Zu diesen Materialien gehören Edelstahl, Glas, Teakholz, Aluminium und viele andere. Sie alle werden kombiniert und in Gleichklang gebracht, um perfekt stilvolle, luxuriöse Tische, Stühle, Sonnenliegen, Sonnenschirme und Hängematten herzustellen. Diese können mit unserem Sortiment an modernen Stoffen aufgewertet werden, die es ermöglichen, einen perfekten Lebensraum im Freien zu gestalten. Royal Botania has teamed up with renowned French landscape designer Louis Benech to produce the first collection in the Royal Botania Black Label series. This exclusive line sees the outdoor furniture and lighting specialist collaborating with top designers to produce special collections in strictly limited numbers. The Nara collection will be unveiled to the press and public during the Salone del Mobile 2016 in Milan from 12 to 17 April. You can discover the Nara collection in Zona Tortona in the exclusive Via Savona 43. Hand-made using the finest teak, the Nara collection is described as “symboliszing both modernity and continuity”, having a very contemporary aesthetic while retaining a link to timeless styles of the past. There are eight pieces, including an outdoor sofa, armchairs and a striking three-footed chair. 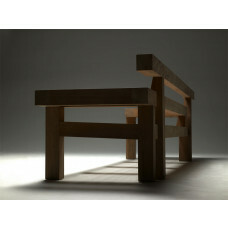 There is also a dining table made of teak with a surface in ceramic. 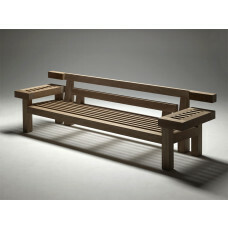 All of these new designs place a focus on the teak material, bringing its strength and rigidity to the fore. 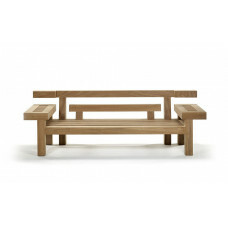 Louis Benech asked Royal Botania to source teak of exceptional density, enabling the construction of solid, weighty pieces that feel planted in the ground and which will stand firm in the strongest winds. During his career, Louis Benech has worked on many established and historic gardens around the world in countries as diverse as Korea, Panama, Peru, Canada, the United States, Portugal, Greece and Morocco. Among the gardens he has designed are the Elysée Gardens and the Quai d’Orsay in Paris, Pavlovsk’s rose pavilion in St Petersburg and the Gardens of the Achilleion in Corfu. He has also worked on the gardens of the National Archives in Paris, Chaumont-sur-Loire’s park, along with the Water Theatre Grove, a contemporary garden for the Château de Versailles. His experience of working in high end outdoor spaces means Louis Benech is already very familiar with the furniture of the Royal Botania brand and its worldwide reputation for quality, design and ergonomics. By combining his expert eye for design and his immense love of gardens, Louis has provided us with an exercise in style using powerful and pure lines. It is a forceful, bold statement that defines a new contemporary classicism. “Between rusticity and refinement, a line with the solidity of a fence and the grace of Japanese toriis. 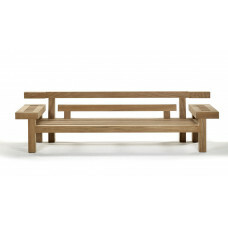 The Nara collection has been skillfully conceived in this spirit” LOUIS BENECH.